Math Cards helps students reinforce their math skills by building math equations or verifying facts. Children and teenagers can play against the PC or a partner in this mathematical facts game. Reinforce whole numbers, integers, fractions, roots, percents, exponents, equations and roman numerals. Match Cards offers the ability to use equivalent cards, eg: 0. 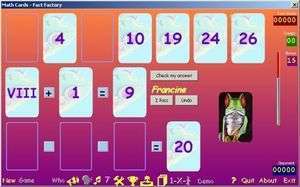 MathCards 1.0 is a shareware program and can be used as a demo to try the software until the free trial period has ended. A full version of the program is available after the trial period ends. For security reasons, you should also check out the MathCards download at LO4D.com which includes virus and malware tests. Additional screenshots of this application download may be available, too.